"Fiodor Lukyanov, chairman of the Kremlin's Council on Foreign and Defense Policy, doesn't expect Syria to ever function within its current, formal borders like a country again. 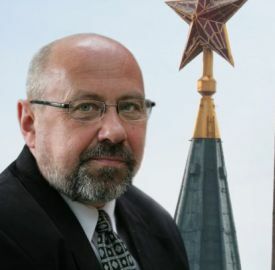 According to him, Russia should strive to create an 'Alawite Israel,' a state that is unified ethnically and religiously and which would be able to defend itself against its neighbors with the help of Russian troops stationed on its territory." Since the Russian Air Force began bombing Syria, three weeks have passed, and we now have its first stunning effect: Putin's popularity among his countrymen, which seemed not long ago like it couldn't go higher, has risen again. The All-Union Center for the Study of Public Opinion just announced that public support for the president has again reached another peak: 89.9 percent – a historic record. This is extremely worrisome. Because while the man in the Kremlin's popularity during his 16 years in power has always been good, it's looks like a sine wave, and nothing boosts it as quickly as the next war. In 2008, the war with Georgia gave him 88 percent support; in 2014, during the annexation of Crimea and the conflict in Ukraine, his numbers rose to 86 percent. What we are witnessing is not new, but rather a very bad tradition. Already in 1904, Russian Interior Minister Vyacheslav Plehve rejoiced at the prospect of an impending conflict with Japan. He assured everyone that what the Empire needed was "a little victorious war," since only a wave of patriotic enthusiasm could save the country from a revolution. The war turned out not so little, and the nightmare of revolution that engulfed the great power a year later ended not long thereafter in final catastrophe for the state of the czars. Winning a "little victorious war" is again a beguiling prospect. Parliamentary elections are due within a year and in 2018 the presidential poll. The ruling camp is carrying some nasty baggage. The Russian economy has shrunk by nearly 4 percent; inflation is already at 15 percent and real wages fell this year by 10 percent. Prospects are bleak. According to experts in Washington, Russia has lost over $100 billion to lower oil prices in the last six months – an amount equal to nearly half the country's next annual budget. So the appetite among the ruling class for a "little victorious war" to guarantee public support will only get stronger. For the moment, the Russians are just such a war. In their window on the world - which is Kremlin-controlled TV, Russian pilots are not so much battling the Islamists but rather the Americans - whom they have totally surpassed. Where those clumsy U.S. pilots missed, the Russians are right on target, day after day destroying military command posts, arsenals and bunkers. In short, they come out on top, which sills the hearts of the nation with pride, allowing people to forget those crisis-ravaged portfolios. With this triumphant narrative as a backdrop, Putin's speech on Thursday at the annual Valdai Discussion Club in Krasnaya Polyana sounded oddly modest. The president rated the achievements of his Air Force in Syria as "modest" as yet, but promising "more to come." In Moscow's eyes, the achievement of success in this conflict would require first of all that countries in the region and the West acknowledge Russia's military achievements by conceding to Russia a central role in the anti-terror coalition. Such hopes would appear in vain. Putin tried sending Prime Minister Dmitry Medvedev to "coalition" talks in the United States. Medvedev was good bait, since the former Russian president is viewed far more sympathetically than the current one. The White House rejected the offer, however – and in diplomatic terms would be considered brusque. Moscow experts like Georgiy Mirsky, a specialist on the Near East at the Russian Academy of Sciences, believes that it will be a major success for Putin if he can "prevent Russia from being sucked too deeply" into the war. It won't be easy. 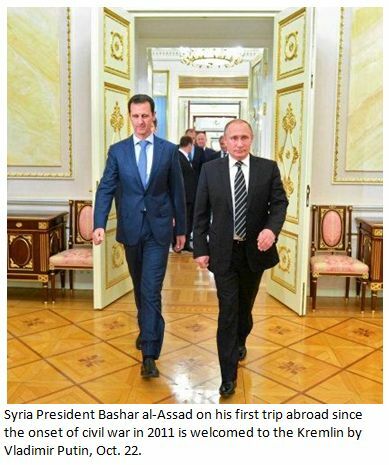 According to Kommersant columnist Maksim Yusin, this is precisely the intention of Bashar al-Assad, who wants to take advantage of Russian troops to regain control over the rest of the country. This dream isn't only that of the president of Syria. At the Valdai Club meeting, Iran Parliament speaker Ali Larijani was particularly active (video below). He even managed to interject into questions addressed to Putin. The Iranian was downright emotional when he protested suggestions that Syria be divided into several states, explaining that they would end of constantly in conflict with one another. It's obvious that Tehran, too, wants to see the Russian army restore order to its neighbor country. Leonid Asayev, Arabist of the prestigious Higher School of Economics, argues that Moscow, in order to avoid "plunging into the quagmire of war," should aspire to a much more modest task: safeguarding control of its client Assad over the region inhabited by his co-religionists - the Alawites. This constitutes only a small part of the country, which is fact has already disintegrated. In this area lies Tartus, where the Russians are rapidly expanding their naval base, and Latakia, where Russian aircraft are stationed. Fiodor Lukyanov, chairman of the Kremlin's Council on Foreign and Defense Policy, likewise doesn't expect Syria to ever function within its current, formal borders like a country again. According to him, Russia should strive to create an "Alawite Israel," a state that is unified ethnically and religiously and which would be able to defend itself against its neighbors with the help of Russian troops stationed on its territory. Lukyanov argues that this would be in the interests of both the great powers and states in the Middle East, as it would help stabilize the situation in the region. Lukyanov himself, however, is doubtful that Moscow's partners would be willing to accept his argument. It is understood that the world would see such an idea as a manifestation of Russian expansion.